The Indonesia Garudas have won the first ever AFL All-Asian Cup, held in Ho Chi Minh City, Vietnam on Friday. The AFL All-Asian Cup featured Asian national AFL players from across Asia, culminating in a 3-way tournament featuring Team Indochina, the China Reds, and the Indonesia Garudas. 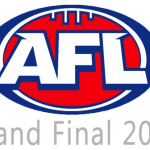 Come and join us for 2016 AFL Grand Final at Grand Senyiur Ballroom, Balikpapan. The event will be held at Saturday 1st October 2016 10.00AM until 17.00PM. 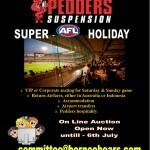 Pedders Suspension are offering a unique chance for some lucky punter to visit Melbourne, watch 2 games of footy on Saturday & Sunday at either Etihad or MCG. Dates to be confirmed with winning bid. The prize includes airfares, accommodation, entrance to VIP or Corporate box for 1 person. Place your bids on line up to the 6th July, the winner will be notified by the Borneo Bears committee. BALIKPAPAN–Sebanyak 4 pemain football asal Balik- papan dari Borneo Bears Australian Rules Football Club yakni Rama, Gilang, Timbul serta Nur berang- kat ke Austaralia untuk melakukan trial ke salah satu club peserta Kompetisi Northern Teritory Football League (NTFL) Australia yang bergulir pada Oktober hingga Maret 2016 yakni Warata. Waratahs football club have recruited two footballers from the Borneo Bears in Balikpapan. NTFL club Waratahs have placed their footprint in Asia with confirmation this week they are bringing two Borneo recruits to Gardens Oval. 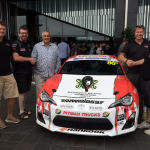 As the Australian Manufacturers Championship season approaches, Victorian based team, Pedders Racing, have been busy trecking their 2013 class champion Pedders 86 across the state to showcase the car, sponsors and series to motoring and aerospace enthusiasts, receiving a grand response to their latest sponsor partners, welcoming AFL Asia affiliated, Indonesian based Australian Rules Football Club, the Borneo Bears.